Regan's humor was not always self-deprecating. He targeted the politicians deliberately. When he was presented with a token baseball bat by the team that had won the World Series, he held the bat like a true slugger and said that he could not wait to use it on the Congress. He had no respect for politicians though he knew that he had to deal with them. To quote Reagan once again, 'Politics is not a bad profession. If you succeed there are many rewards, if you disgrace yourself you can always write a book.' Reagan used humor even under the direst situations. On a personal level, he always had jokes and anecdotes that infused congeniality into everyone around. Even when he was shot in March of 1981, while lying on a gurney in the hospital, he could not stop from cracking jokes. When he first saw his beloved Nancy, shaking with grief and concern, Reagan smiled at her said, 'Sorry honey, I forgot to duck!' Later as he was being led into the operating room, he looked at the group of masked doctors (who certainly revealed nervousness in their eyes), Reagan said, 'I hope you all are Republicans!' Only a man at peace with himself and trust in his fellow Americans can be so relaxed under these circumstances. When he was convalescing in the hospital following his surgery, he once spilled some water on the ground. The secret service people found him on his hands and knees trying to wipe the floor dry. He said that he did not want his nurse to get into trouble. Humility thy name is grace! 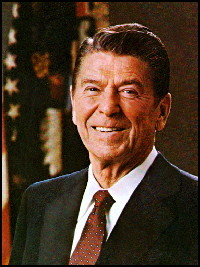 Long before he entered politics, when he was still making movies, a friend asked Reagan, 'Why don't you run for President?' 'President of what?' asked Reagan. 'Of the United States' came the reply. 'What is the matter, you too don't like my acting?' quipped Reagan. Reagan's love for Nancy is legendary. He once said. 'There may be a thousand people in the room, but when Nancy leaves the room, I feel lonely' Once he and the prime minister of Canada were waiting for their wives to arrive. As the two ladies were walking toward them, Reagan put his arm around the prime minister and said, 'For two old Irish guys we sure married up!' He always contented that Nancy was too much for him. World today is still full of peril. The old Soviet Union may be gone but the threat of terrorism looms large. We always wonder ' what would Ronald Reagan have done, faced with this danger today? There is no doubt that he would have taken unconventional, bold steps. He would have faced the problem head on. He would have gone directly to the people and asked for their support. In the shadow of this great American President, it behooves us to stay together and 'win one for the Gipper.' As this 'Great Communicator' rides into the sunset, he would expect nothing less from us than to be bold and guard our freedom with our own lives, at all costs. The next generation of Americans, our children and grandchildren are worthy of our efforts. As we affectionately watch the pomp and ceremony of the dignity of the funeral for this dignified man, we look back at the eighties with nostalgia. We wish we could have another Reaganesque president to lead us during our difficult times. He has left an indelible mark on all of us, admirers or detractors alike. It is impossible to hate such a man.